A dozen miles from Salcombe, the Yealm is probably Devon’s most restful estuary, completely hidden from offshore behind Yealm Head. The first time I approached this coast I doubted there could be a river here at all. The cliffs were deserted, with hardly a house in sight, but then I spotted the leading marks and assumed they must go somewhere. The shallow entrance has a drying bar jutting well across from the north, but is simple enough an hour before high water. Inside this secret river you can lie alongside a pontoon on the south side of Yealm Pool, beneath a wooded shore. Then Newton Arm forks to the east while the main channel continues north through moorings towards another pontoon. You’ll see a packed dinghy landing leading to Newton Ferrers village and its jumbled riverside houses. 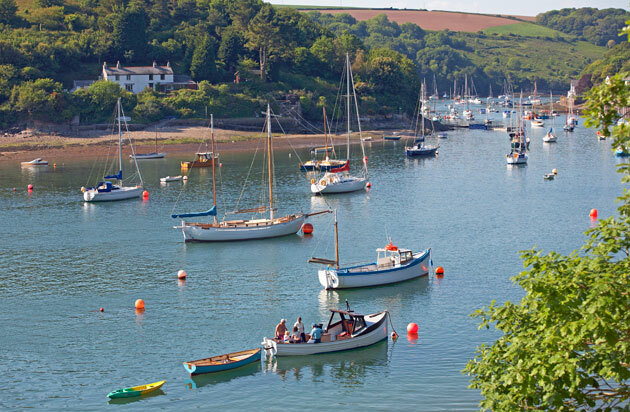 On the north side of Newton Arm, The Dolphin has super views and is next to Yealm Yacht Club with its cosy bistro. On the south side, Noss Creek has The Ship Inn on its west bank and The Swan on the east.